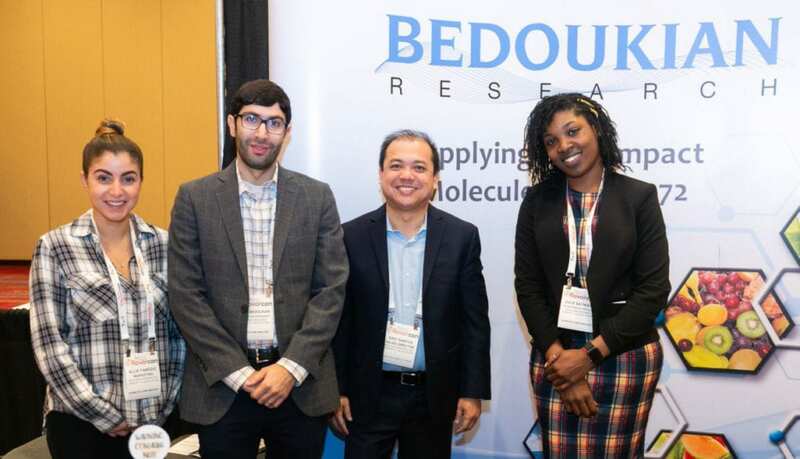 Flavorcon has come and gone, and as always Bedoukian was glad to be apart of the show! During this global, interactive conference, hundreds of flavor industry professionals gathered to participate in a series of interactive tasting, sensory sessions, and product demonstrations which allowed individuals the opportunity to build partnerships and gain the insight and knowledge needed in order to continue to create innovative flavors for the years to come. As a parting gift, Bedoukian included miniature bottles of our special Bedoukian Pancake Syrup demonstration in the event registration bags – exemplifying the outstanding effect our brand-new ingredient Nuezate applies to Maple Syrup. Additionally, Bedoukian Research’s Applications Specialist, Julie Sathoud made her Flavorcon Stage debut presenting “9-Decenoic Acid, A Solution For Fat Reduction.” During this discussion, Julie demonstrated the impact of Bedoukian’s 9-Decenoic Acid for fat modulation in flavors – imparting a creamy, waxy sensation, coating the mouth and adding the fatty mouthfeel back into low-fat food and beverages. Although not natural, we see many applications for N&A and artificial flavors in coffee, confectionery, dairy, and other products. If you were unable to make it to Flavorcon and would like to receive additional product information or request samples, please contact customer service.